The first chapter is available for free online here, and regular corrections and updates are also available online. All proceeds go to the non-profit Institute for Social Inventions which publishes the guide. You may also wish to buy the accompanying full-colour map that goes with the guide, our preferred map for walkers in Gomera (1:40,000 with GPS waypoints; made from waterproof & super-durable polymer; 2004 edition). Click here to order the map. It's only £7.00 incl. p&p. 'La Gomera is proving stunning thanks to your book. Yesterday was the marathon to Alajero – fantastic! All corrections will be credited. 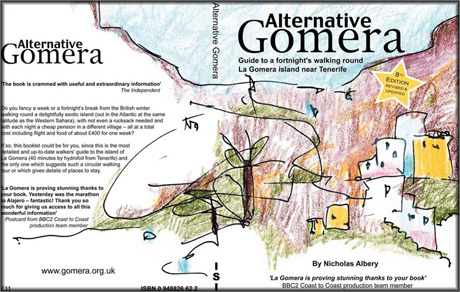 Alternative Gomera is published by the non-profit Institute for Social Inventions, which is a charitable project of the Nicholas Albery Foundation, UK registered charity 1091396. The charity trustees are Neil Almond, Megan Meredith, and Roxanne Persaud. If you are interested in walks in the countryside within an hour by train from London, with a pub at lunchtime and a tea place in the afternoon, see the Time Out Book of Country Walks also by the late Nicholas Albery (obituaries of Nicholas can be read at The Times and at The Independent and at The Guardian and at The Telegraph).